Plato's meeting with Socrates had been a turning point in his life. and under the guidance of the old "gad-fly" (as Socrates called himself) he passed from mere debate to careful analysis and fruitful discussion. "I thank God," he used to say, "that I was born Greek and not barbarian, freeman and not slave, man and not woman; but above all, that I was born in the age of Socrates." to be replaced by the rule of the wisest and the best. It became the absorbing problem of his life to find a method whereby the wisest and the best might be discovered, and then enabled and persuaded to rule. his friends urged that Athens was unsafe for him, that it was an admirably propitious moment for him to see the world. And so, in that year 399 BCE, he set out. and was somewhat shocked to hear from the priestly class which ruled that land, that Greece was an infant-state, without stabilizing traditions or profound culture, not yet therefore to be taken seriously by these pundits of the Nile. 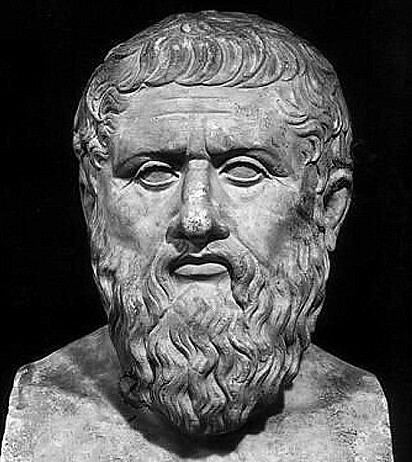 the memory of this learned caste, theocratically ruling a static agricultural people, remained alive in Plato's thought, and played its part in writing his Utopia. and once again his susceptible mind was marked with the memory of a small group of men set aside for scholarship and rule, living a plain life despite the possession of power. 12 years he wandered, imbibing wisdom from every source, sitting at every shrine, tasting every creed. Some would have it that he went to Judea and was moulded for a while by the tradition of the almost socialistic prophets; and even that he found his way to the banks of the Ganges, and learned the mystic meditations of the Hindus. We do not know. He returned to Athens in 387 BCE, a man of 40 years now, ripened to maturity by the variety of many peoples and the wisdom of many lands. He had lost a little of the hot enthusiasms of youth, but he had gained a perspective of thought in which every extreme was seen as a half-truth, and the many aspects of every problem blended into a distributive justice to every facet of the truth. He had knowledge, and he had art; for once the philosopher and the poet lived in one soul; and he created for himself a medium of expression in which both beauty and truth might find room and play—the dialogue. Never before, we may believe, had philosophy assumed so brilliant a garb; and surely never since. Even in translation this style shines and sparkles and leaps and bubbles over. "exhibits the rare union of close and subtle logic with the Pythian enthusiasm of poetry, melted by the splendour and harmony of his periods into one irresistible stream of musical impressions, which hurry the persuasions onward as in a breathless career." It was not for nothing that the young philosopher had begun as a dramatist. we cannot always tell in which character of the dialogue the author speaks, nor in which form; whether he is literal or speaks in metaphor, whether he jests or is in earnest. "Shall I, as an older person, speak to you, as younger men, in apologue or myth?" asks his Protagoras. they were explicitly adapted (obscure though they may seem to us now) to the understanding of the man who must taste philosophy as an occasional luxury, and who is compelled by the brevity of life to read as he who runs may read. much that today will seem irrelevant and fanciful, but might well have served as the very sauce and flavour by which a heavy dish of thought was made digestible for minds unused to philosophic fare. He inveighs against poets and their myths, and proceeds to add one to the number of poets and hundreds to the number of myths. He complains of the priests (who go about preaching hell and offering redemption from it for a consideration—cf. The Republic), but he himself is a priest, a theologian, a preacher, a super- moralist, denouncing art and inviting vanities to the fire. He acknowledges, Shakespeare-like, that "comparisons are slippery" (Sophist), but he slips out of one into another and another and another; he condemns the Sophists as phrase-mongering disputants, but he himself is not above chopping logic like a sophomore. here we shall find his metaphysics, his theology, his ethics, his psychology, his pedagogy, his politics, his theory of art. communism and socialism, feminism and birth-control and eugenics, Nietzschean problems of morality and aristocracy, Rousseauian problems of return to nature and libertarian education, vital and psychoanalysis —everything is here. "Burn the libraries, for their value is in this book." Let us study The Republic.